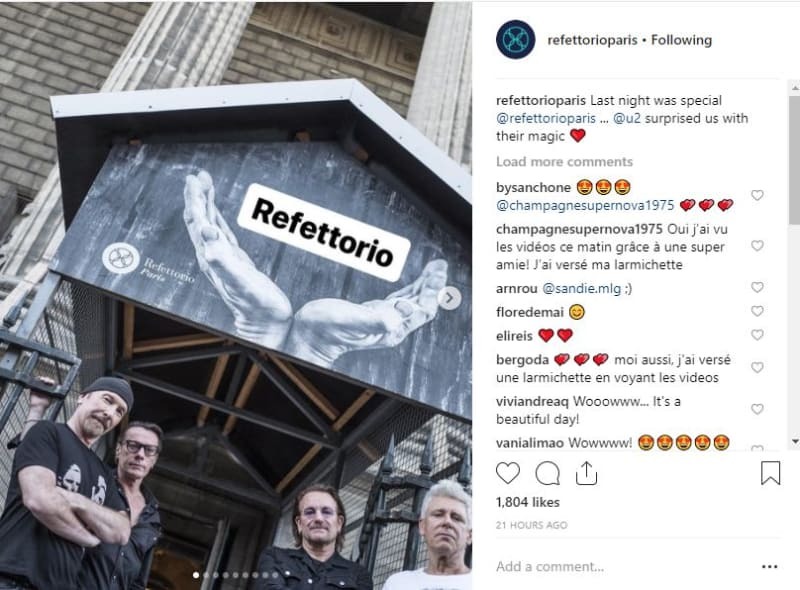 Chef Massimo Bottura has posted a heartwarming video of Irish rockers U2 paying a surprise visit to his Paris soup kitchen and serenading homeless diners and volunteers with a private concert. During an acoustic rendition of the song "One," an Instagram video shows lead singer Bono pick up a crying, unhappy child, while singing the feel-good lullaby. Of course, Bono being Bono, within seconds the crying fades as he gently rocks the girl to his singing, accompanied by his band mates playing in the background. The group is in Paris this week for their U2 Experience and Innocence Tour. Refettorio Paris is one of several international soup kitchens from Italy's top chef which feeds the homeless using grocery store surplus. In other surprise celebrity visits this week, Canadian actor Ryan Gosling dropped in at Grinder Coffee during TIFF in Toronto, after café owners mounted a funny Twitter campaign that went viral. For days leading up to Gosling's TIFF visit, the café posted photos with life-size cut-outs of the actor, begging him to visit. Even Toronto Mayor John Tory played along, posing beside it. The real-life Gosling eventually did drop by, at the request of his mother who spied the campaign online.